"Value-Driven Design and Implementation of Business Processes"
Value driven business process management focuses systematically on creating business value. In many organizations, the key challenge is adapting to an ever-changing business environment in order to strive in this digital world. What is the business strategy to overcome this challenge and how to execute it? A key component of a Business Process Management is a structured value-driven design of processes realizing the business strategy of an organization. A value driven approach to design and implementation of processes enables organizations to use resources where they provide best value during improvement initiatives, which focuses on moving the organization to the next level of performance, including the right degree of digitalization. Value-driven implementation: Enable a consistent, value-driven process design and implementation. Segmenting business processes:Segmentation of business processes is needed in order to use it to drive process design and implementation. Value-driven Process Design approach: All information necessary for a holistic process design and process implementation. Process Impact Assessment: identifying the high impact “high opportunity” of business processes. 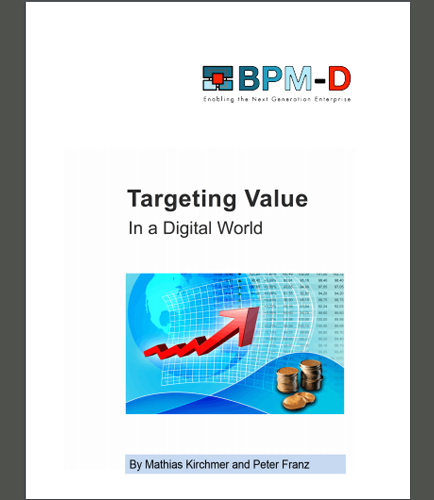 BPM-Discipline to sustain value: how to sustain the results once business processes have been designed and implemented targeting business value.